There is so many ways to entertain the family in Sydney that it’s hard to know where to start! With heaps of great activities centred around the harbour, staying close to the action in the CBD or Darling Harbour is the way to go. So to save you some time, we’ve assembled our top 5 family-friendly things to do around Sydney’s iconic city. You can really spend a good couple of days entertaining the whole family, just in Darling Harbour. Madame Tussaud’s is always fun, with Justice League and Marvel favourites as well as some of the world’s great sporting, music and historical icons. Sea Life Sydney Aquarium is right next to Madame Tussaud’s and gives everyone a close-up view of some awesome marine life. In the same precinct as our wax and marine friends, you’ll find Wildlife Sydney Zoo so you won’t have to worry about walking for miles to cover off some really entertaining and educational activities for the kids. There are some great ticket deals available that let you visit all three attractions, and a few more, at discounted prices, so be sure to check it out here. If all the excitement gets too much, why not experience the ‘zen’ of the Chinese Garden of Friendship or stroll over to the Australian National Maritime Museum? The Powerhouse Museum has some stunning programs and events over the summer and covers everything from Star Wars special effects, fashion, Akira Isogawa and ‘Fabulousness’ through to physics displays, electronics and space. 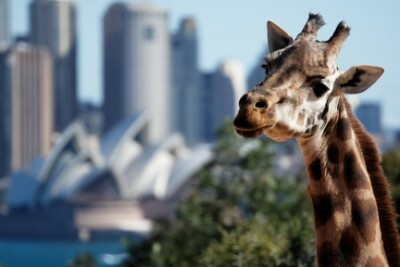 Just a 15 minute ferry ride from Circular Quay is Taronga Zoo home to over 350 species of animals. There’s so much to see here with Gorillas, Meerkats, Giraffes and even some dinosaurs making an appearance over the summer. For a next-level family treat, the Roar and Snore accommodation is something to behold with fully catered safari-style accommodation letting you socialise with the zoo’s inhabitants at night. Another of Sydney Harbour’s famous icons, which just happens to LOVE kids, is the amazing Luna Park! There’s everything from the Tango Train and the Carousel to the Ferris Wheel or the more hair-raising Wild Mouse Roller Coaster. Then there’s the classic sideshow games, Laughing Clowns and all the fairy floss and hot dogs a person can eat. If that’s not your style, try the Helter Skelter Café for a burger or a sandwich, or The Deck for a drink overlooking the spectacular harbour. This experience will give you views to die for over the harbour, but your small people need to be at least 8 years old and 120cms tall to do the Bridge Climb. You’ll be given a pre-climb prep and all the outdoor gear you’ll need to do the climb safely. There’s a choice of climbs so you can choose the time of day to climb, and you don’t even have to go all the way to the top! Circular Quay occupies a spectacular place on Sydney harbour, adjacent to the Sydney Opera House, with stunning views over the harbour to the bridge. Take a tour of the Opera House, go on a Jet Boat Adventure, visit the Museum of Contemporary Art Australia or the Botanic Gardens. Then take the kids for a leisurely boat ride around the harbour for some sightseeing! When you start from Circular Quay, you’re a quick ferry ride from Luna Park, Taronga Zoo, Eat Street at Parramatta and of course, Manly Beach. Take the iconic Manly Ferry and spend a day snorkelling at a fish sanctuary, hire a kayak or bike, or have a BBQ at one of the stunning beach parks. Need more family holiday ideas for your Sydney travels? This great blog may be what you’re after! For maximum convenience, get an Opal Card for travel on public transport in NSW. You add value to your card, and then tap on and tap off to pay your fare, and it covers train, bus, ferry and light rail services in Sydney and greater NSW.